is this a regular issue with the powerbooks? is there anything i can do? If the paint is peeling you don't have a new Powerbook. You have one of the first two Titanium models released. Yeah, there is no way for paint to peel since there is no paint on the aluminum Powerbooks. or a painted Aluminum 1.5 GHz PB? it's not peeling but theres like black specs where my hands are when I type on the keyboard, i guess it's corroding ? so what should I do ? any responses? dude, how long have you used it for? Though I think aluminum is a novel idea for a Powerbook I?m liking it less and less. It dents, attracts fingerprints and it?s bulky looking. Time for a new material, any suggestions? What happened to your notebook is not uncommon; there is someone in my office with the same problem. 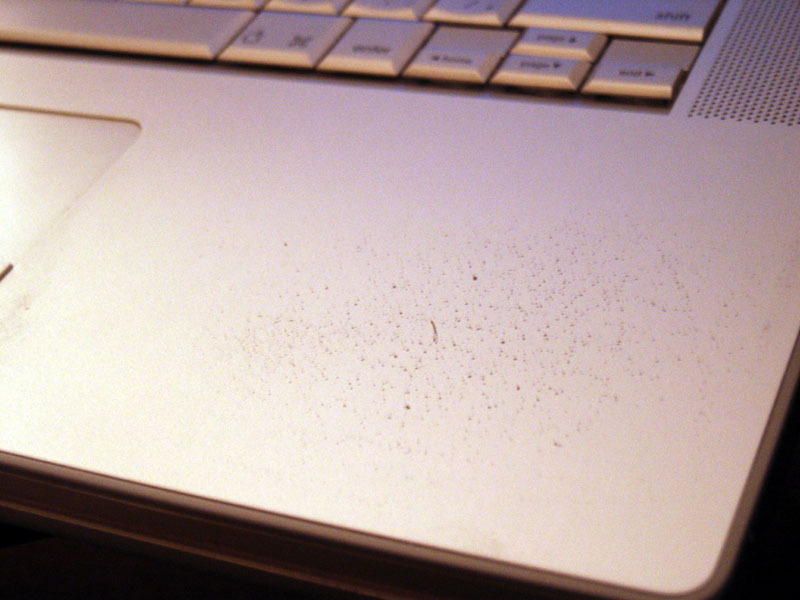 We believe its do to not cleaning the surface before applying the paint/sealant/fairy dust or whatever the substance is that?s covering the Powerbook. Is the PowerBook's casing made out of pure Aluminium or does it have a protection material over the metal (other than the natural oxidisation i.e. rusting)? If yours looks like the one in that photo, I think you ought to see what Apple will do about it. If there is an Apple store nearby, that would be my first try. If no luck there, you should call for an RMA. Polite but firm notes to this address often actually get attention. I have personally had it happen. Not at all. Someone reads every one of those and if it clearly states a persistent problem, someone will call or email you. I have used it several times, and several of the members at BroadbandReports have had a reply also.